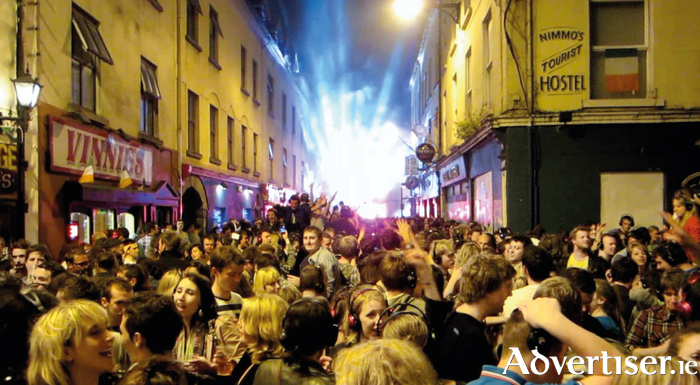 THE SILENT Disco Street Party, which was cancelled due to last weekend's poor weather, will now take place tomorrow on Dominick Street, from 8pm, and all original tickets for last Sunday are valid. Hosted by the Róisín Dubh, two DJs play classics, anthems, guilty pleasures, songs you love, and songs you love to hate. Expect ‘Bohemian Rhapsody’, ‘Don’t Stop Belivin’’, and the Star Wars theme. You can switch between the DJs depending on who is playing what you like, or simply enjoy looking at hundreds of people dancing and singing along to classic hits, anthems, guilty pleasures, and pure cheese - except no music will be heard as they will be all wearing headphones. The event is over-18s. Admission is €20. There is a €10 deposit which will be refunded when the headphones are returned. Tickets are available from roisindubh.net, Massimo, OMG @ Zhivago. The Movie in the Park event has also been rescheduled to Sunday August 16. Again tickets for the original event are still valid and the long range forecast is good.